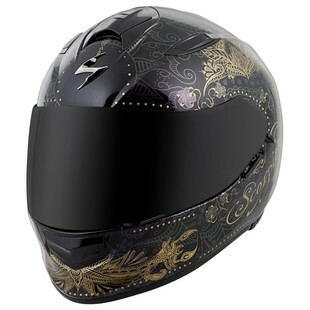 Have you been searching for a helmet that shows off your love of ornate gilt brocade? Have you been watching Spurg's review of the Black Brand Sheared Beaver and looking for something to match? The Azalea helmet can help reveal your inner Gothic seductress without sacrificing safety or the features of a good helmet. The Scorpion EXO-T510 Azalea Helmet is ideal for a spirited commute or a long Sunday ride, thanks to it's advanced ventilation, drop down sun visor and inflatable cheek pad system. As is the case with the majority of Scorpion’s lineup, the EXO-T510 Azalea is all about adding value through feature-rich gear, and doing so without draining your pockets. As far as bang-for-your-buck goes, the T510 is at the front of the class. Add in the intricate Azalea graphic, and it only gets better. No longer should you expect to sacrifice aesthetics for quality, nor ruin a great outfit with an unmatched lid. Ride on with the new EXO-T510 Azalea, and do so in style.